There are many happy riders that are impressed with the way that this Carrera Vengeance Womens Mountain Bike responds to the trails. The response times of this mountain bicycle are an interesting talking point in user feedback. There are some riders that are surprised by the sharp stops and quality of the brakes. The specification talks about the use of Tektro mechanical disc brakes with the aim of “more powerful and consistent stopping”. It seems that few would argue with this idea. This sense of speed and quick reactions also comes from the gears and handling of the bike. It has 24 speed Shimano Tourney gears, 27.5″ wheels with Kenda MTB tyres and an aluminium frame. Then there are those that are impressed with the suspension offered with this Carrera Vengeance mountain bike. This model has Suntour suspension fork with 75mm travel and many feel that this makes a difference. There are therefore many people ready to ride out and test their skills on this new bike. The problem is that while these crucial elements are great, there are some cheaper aspects to this Carrera Vengeance Bike . It is a similar story with this mtb as with many other models that try and help those on budget. The company does a great job in providing high quality components in priority areas, but holds back a little with lesser elements. There are riders that mention the upgrades that they have made to their bike, especially around the seat and pedals. They would rather pay a little more to have the quality and size they want, rather than put up with with Carrera provide. Then there are those that talk about some of the cheap, flimsy materials in the finish. For some, it is the handlebar grips that let the bike down as they wear away. Others don’t like the cheap cable ties. How does all of this affect the final recommendation for this Carrera Vengeance Womens model? There are some clear pros and cons here that new riders need to be aware of. The biggest con is the money and effort that may be needed to improve some of the lesser elements. Yet, there are some that might appreciate this chance to fine tune what is an otherwise impressive bike. The main selling points here are the response of the bike on the trails, particularly in relation to the braking and suspension. This is enough to earn the Carrera womens mountain bike a recommendation for those keen to get started with mountain biking. 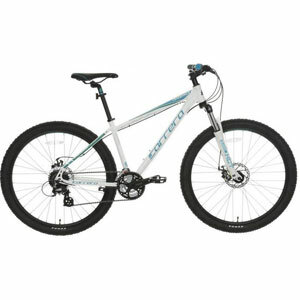 Find more reviews about the Carrera Vengeance Womens Mountain Bike on Halfords here.